In 1870 the population of Iceland was approximately 70,000. Looking at the population by percentage, approximately 75% of the people were farmers, 10% made their living in the fishing industry and 15% were craftspeople or government employees. Reykjavík and Akureyri together had a population of under 3,000 people. There were few other towns and so the vast majority of citizens were living in rural areas. Many were subsistence farmers, living in crushing poverty, with little opportunity to make a better life for themselves and their families. 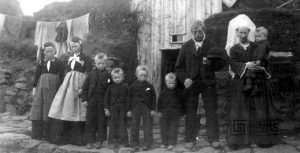 The economic conditions of the country at the time played a big part in the decision to leave the country and this was supported by the various agents, hired by the shipping lines, who travelled around Iceland encouraging people to emigrate. As time passed and emigration increased, more people had family and friends who had emigrated and were sending home word of positive experiences in the ‘New World’. The records show that roughly equal numbers of men and women emigrated, eighty percent of them being under 40 years of age. Approximately two-thirds of them were from the northern and eastern parts of the country. It may be said of all the Icelandic emigrants that to undertake such a long journey, to an unknown land, took courage and stamina. Surely most of the emigrants believed they would never see their native land again. 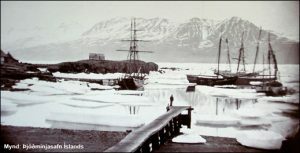 In his book ‘Vesturfaraskrá’ published in Reykjavík in 1983, Júníus H. Kristinsson records 14,268 Icelanders who emigrated to North America between 1870 and 1914. However, only emigrants for whom there is reliable documentary evidence have been listed. It is agreed that all records of emigration have not been preserved and that many emigrants somehow avoided being registered. Thus, this record is certainly not complete and may in fact exclude thousands of emigrants. It is generally estimated that somewhere between 16,000 and 20,000 Icelanders emigrated; 20 – 25% of the total population of Iceland at the time. 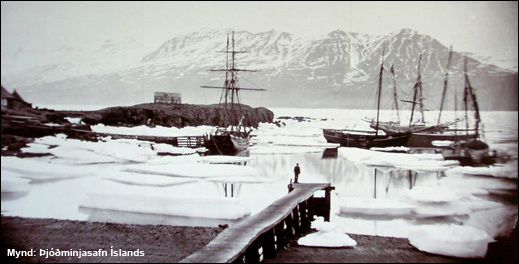 The latter half of the 19th century in Iceland featured harsh weather and natural disasters which led to economic hardship. A series of hard winters, cold summers, pack ice, violent winds, heavy snow and sand storms led to land erosion, crop failure, poor harvests, little fodder for animals and loss of livestock throughout the country. In 1875, an eruption of the volcano Askja covered parts of the North and East with poisonous ash and pumice, adding to the already desperate situation of many farmers. At the same time, news of the mass movement of emigrants from Europe to North America was reaching Iceland. As was happening in much of Europe, Iceland was experiencing many changes, chief amongst them the lack of opportunity for farmers to acquire and profit from their own farms, and opportunity for employment. People considered seriously the promise of having their own land or gainful employment and thus a more prosperous life in the ‘New World’. Undoubtedly many people chose to emigrate to escape their desperate situations, but also some more prosperous Icelanders were intrigued by the adventure and potential for economic success, emigrating by choice rather than necessity. In the later years of emigration many emigrants were joining friends and relatives who had gotten settled, and who were prepared to provide assistance to the new arrivals.